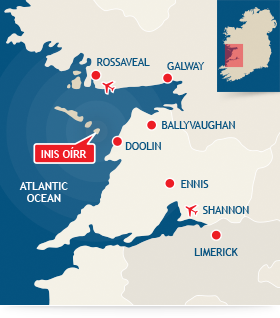 Inis Oirr is our wonderful island home. It is also a long-lived Atlantic community in constant celebration of its unique culture and modern ways. This is the blend that shapes who we are on Inis Oirr today – not from elemental remoteness, but from a wonderful engagement we perennially enjoy with all worldwide who travel and visit us. This is the essence of our Island life today – a cosmopolitan place where everything seems in change, and yet nothing seems in change. Recognised for a warm and outgoing spirit, and graced with a welcome that extends beyond our island waves, we delight in the company of all who visit, and with little ado, join that endless stream of island chat and caint. Daily ferry services from Doolin and Galway. Close to the Burren, the Cliffs of Moher are clearly visible from the island.